is a microstock site by Yuri Arcurs Photography that launched on May 1st, 2012. On Peopleimages.com you can get royalty free images and stock photos. They offer a lot of different scenes, styles, keywords and topics to choose from. The site features an extensive search page and suggestion algorithms. If you are not completely satisfied with the look of a particular photo that you are interested in, you can select between a wide variety of retouching options. 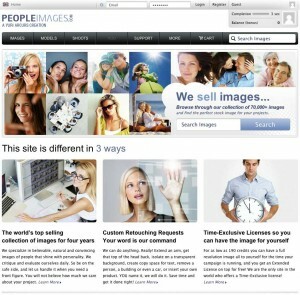 This is a screenshot of PeopleImages.com from the first day it went live and was accessible to the public. There was an extensive amount of beta-tester feedback incorporated in my work. While it was possible to use default frameworks and libraries for most parts of the project, some things had to be rewritten completely to fit the needs of this project. If you plan a similar project yourself or need an experienced developer for hire, please do not hesitate to contact me.